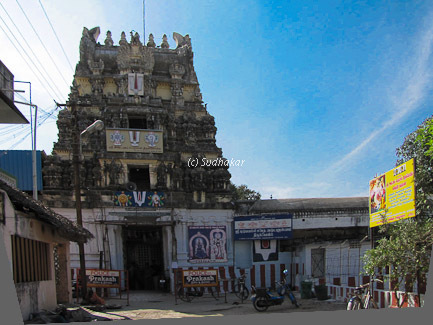 Ashtapuja perumal temple is one of the 108 divya desam temples situated in Kanchipuram. 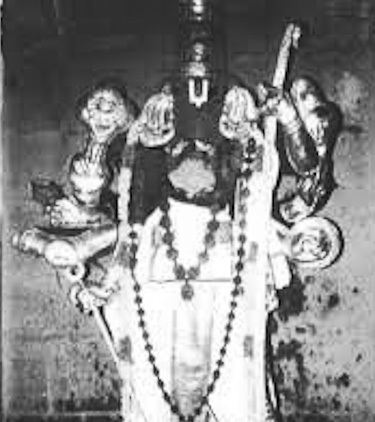 The perumal in this sthalam is called 'Ashtapujanga perumal' and he is seen with eight hands ( Ashta - eight, Puja - hand). He is also known as Adikesava Perumal and He holds Chakaram, Sword, a Flower and an Arrow on four of His right hands and Sangu ( a conch), Bow, a shield and Gadha (A mace or a big club we find used by Hanuman and Bhima). The sthalapuranam of this temple is also associated with that of Saraswathi and Lord Brahman.All the asuras who were sent by Goddess Saraswathi to destroy the yagam performed by Brahma were killed by Sri Narayana. Saraswathi finaly sent a ferocious snake.Lord Narayana took the form of Ashtabhuja Perumal holding eight different weapons to kill the snake. The snake then surrendered to Lord Vishnu and He ordered the snake to stay in the Vaayu end of the yaaga sala as "Sarabeswaran" to gaurd Lord Shiva's yagam. There is a pushkarni ( a lake or pond) here and as per legend there used to be an elephant called Gajendra who performed pooja to Maha Vishnu using the lotus flowers from this pond. One day a crocodile caught Gajendra and there was a big struggle. The elephant was about lose the battle when cried 'Adimoolamae' seeking Sri Narayana's help.Sri Narayana rescued the elephant Gajendra from the crocodile's mouth using his 'chakra' cutting the neck of the crocodile. He then gave motcham ( salvation) to the elephant here. The Moolavar of this Sthalam is Sri Aadikesava Perumal. Other names are Gajendravaradhan, Chakrathaarar. Moolavar is in standing position facing West . Prathyaksham for Gajendran the Elephant. Temple location It is situated in Kanchipuram around 2 kms from Varadaraja temple. Where to Stay? There are many semi deluxe hotels in Kanchipuram Other interesting places around Kanchipuram It is a temple town with 15 out of the 108 divya desams spread around here.